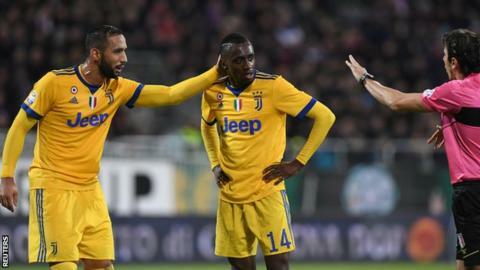 Serie A has announced no action will be taken against Cagliari after Juventus midfielder Blaise Matuidi said he was the victim of racist abuse during his side's 1-0 win on Saturday. The France international revealed in a post on his Facebook page that he "experienced racism during the match". "Weak people try to intimidate with hate," he said. Serie A says it cannot take any action because the referee and match observers did not hear the racial abuse. Federico Bernardeschi scored the only goal of the game 16 minutes from time as Juventus recorded a sixth win in seven games to head into the two-week winter break one point behind leaders Napoli. The game came just two days after Verona received a suspended partial stadium ban and fine for a section of their fans racially abusing the 30-year-old. The incident at Verona took place on 30 December, when Matuidi scored the opening goal in a 3-1 win. The Serie A club were punished for "the expression of racial discrimination, lasting about 10 seconds" towards Matuidi by a section of the home supporters in the fifth minute.